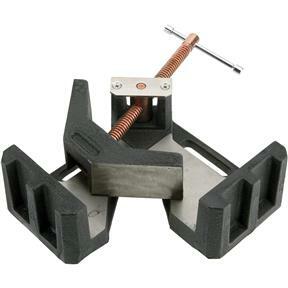 This 90 degree angle clamp takes the set-up time and effort out of metalworking applications that involve holding material for right angle joining, assembling, welding or grinding. 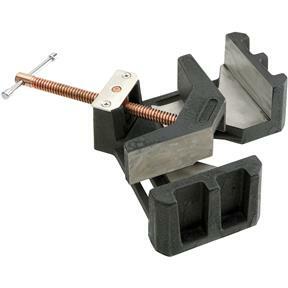 A self-centering jaw quickly adjusts to clamp workpieces, even accommodating pieces of different sizes. 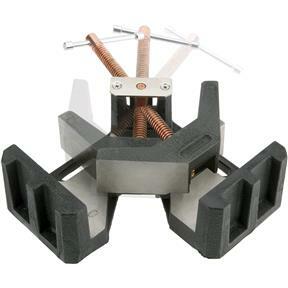 Speed, safety and accuracy are the key benefits that this clamping innovation brings to your shop. 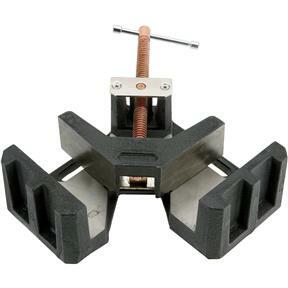 The 90° angle clamp is made of high quality cast iron. The spindle, which automatically pivots for an accurate 90° grip, is also copper plated to resist weld spatter. Slotted holes are provided in the base for convenient workbench mounting. Work surface and base are milled for added precision. Weighs approximately 29 lbs. 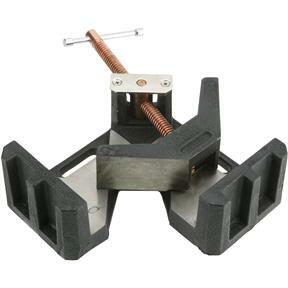 Purchased a set of 4 of these to aid in welding and wood project construction. They have become more helpful than originally planned and I use them when building drawer boxes as they hold everything perfectly square during assembly. I would recommend these.